Sixteen Years, 364 Days and Three Hours. I am, and have been for the past 16 years, 364 days and three hours, living on bonus time. On October 17th, 2000 at about 8:00 a.m., my expiration date came, I was heading to “meet my maker” (whoever or whatever that might or might not be), I was not expected to survive. For almost 16 years I have come across this day with, always, some degree of gratitude, but the reflective process itself has also changed over the years. I can’t say whether the processing of what went down is the change agent, whether my age and “new” lifestyle (not so new anymore, but compared to what it was, still new) is responsible for my outlook or what, but one thing is sure: October 17th, 2000 was a red line, a demarcation, a catalyst - if not for the events of that day, my life today would be much different. I don’t remember much of that day, nor do I remember in any great detail the days leading up to it. I do, however, remember pretty clearly what my life was like at the time. In a word, it was chaos. It didn’t get that chaotic overnight, and there were numerous periods where I was more or less “in control,” at least compared to the out of control periods, but as soon as anything externally upset my life, I went off the deep end. But even that, while true when looking at a particular period in isolation, is not the whole story. Going off the deep end was easy for me, anything that shoved me even a little could be my reason to jump. At the end, I didn’t need a reason. Or… anything was a reason, because being responsible for the consequences of my behavior was not part of the deal. At least not yet. I don’t know if I slept this night 17 years ago. If I did, it likely wasn’t much and if I did, it was likely the first night in probably three or four that I did. My chaos was both created by and manifested in drugs and I liked the ones that took me up, not down. In the end (this end, there were others not as dire), as long as I was well supplied, I’d be up for anywhere from three to five days before sleeping one. Don’t ask me to explain what was attractive about that, I could not say, but I do know that at the time, it was my everything. I didn’t know it, I didn’t think so and I would not have believed it, but I was absolutely dependent on drugs. I kind of remember being woken on the morning of the 17th, but it was not like I actually had gone to bed and slept all night, it was more like I was trying to make it to the morning and fell short. I kind of remember dozing off right about dawn and being shaken awake by one of my “friends,” of maybe one of my two younger sons (my eldest lived with his mother). Yes, this chaos went on around them and as much as I tried to isolate them from it, there is no way, especially towards the end, I could keep their lives and that world completely separate. I needed to get up so I could drive my boys to school and then go to work. I didn’t want to make the drive from eastern Truckee, CA to Squaw Valley, CA. It was about a 20 to 30-minute drive and I was tired. I suggested to them that they might be “sick.” My younger son smelled the bait and took it, but my middle son was struggling in school and told me that he was not too sick to go to school, that he couldn’t afford to miss a day. I was tired, I didn’t want to make the drive, but I didn’t think for a moment that I couldn’t. I also, despite the humbling acknowledgment that I put my kids in harm’s way too many times, still had that sacred parental commitment to my kids. Drug addicts deal with their kids differently - some leave them behind with family, the “system,” wherever, others drag them through it and try to function. I tried and in many cases succeeded in giving them experiences that any boy would love to have growing up. But with that came the chaos and way too many things that no kid should be exposed to. I piled my 13 year-old son and roommate into a Jeep Cherokee (a rental, a story for another time), and made it to the old industrial section of town to drop off my roommate. My son had dozed off in the car on the way (they both frequently would, it was a bit of a drive early in the morning) and while in the parking lot, I took a little “break.” We were already going to be late, so a quick cat-nap seemed like a good idea. I don’t know how long that lasted, maybe 10 or 20 minutes, but my roommate came out and woke me so I could continue my drive to Squaw Valley. I went down West River Street, turned left onto Highway 89 and that is the last thing I remember. It was just about, almost exactly, 16 years, 364 days and three hours ago. So, why not write this tomorrow, on the actually anniversary? That’s a fair question, I promise I’ll answer it. 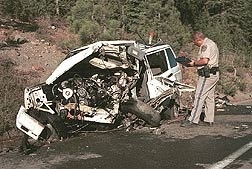 I don’t know when it happened, but because I had fallen asleep at the wheel, I drifted into the northbound lane, about one mile before Squaw Valley and, although traffic is usually light at that time, there just happened to by a loaded logging truck coming toward me. None of this part of this story comes from my memory - what I remember is sketchy and seriously distorted by what was about to become my condition, a condition that should have (not could have) killed me. I might have been awake until then, I might have nodded off and instantly came too (most drivers have encountered that when on a very long drive, especially at night), it is unlikely I was that soundly out until the scene of the wreck because that road is not anywhere near straight. In fact, it was on a sweeping right turn that I went straight - straight into the logging truck. The police report states that the truck driver sounded his horn several times and moved as far right as he could, but the front left of the Jeep still managed to find the front left of that Kenworth in an impact that was estimated to be a combined 100 mph. The truck driver could see me and he stated that it looked like I was asleep. My left foot was up on the dash and I was “kicked back” in a way that I drove with some frequency. This time, however, my relaxation was complete. I’ll dispense with the mystery of how my son came through it; he survived with minor physical injuries. He had to extricate himself through the back window and he saw more than any 13-year-old should have to see, but he was in front and on the right - away from the impact. His seatbelt, the airbags and perhaps the fact that he, too, was asleep, saved him from any major injuries. My injuries were much, much more serious. The first responders from the Squaw Valley Fire Department had to cut me out of the vehicle. My left leg was almost torn off at my pelvis. I had an open compound pelvic fracture, a compound femur fracture, a lacerated kidney, liver and femoral artery, among hundreds of other less serious injuries. All of those major injuries listed, the fractures of those large bones as well as the laceration to two organs, not to mention the laceration of a major artery, all contributed to a mass exodus of blood from my body. I was, literally, a bloody mess. I was taken by ambulance to Tahoe Forest Hospital in Truckee and flown by helicopter to Washoe Medical Center in Reno, NV. By the time I got to Reno, they emptied 16 units of blood into me. Between that hospital and a rehab hospital also in Reno, I would spend the next three months in northern Nevada. I woke up after about five weeks, sometime prior to Thanksgiving. I was in a “medical coma,” so what I remember from those five weeks is only very loosely based on reality. I don’t know how long it was before I became fully lucid, but I know it was a process. Eventually I knew where I was, why I was there and what happened. I was in utter disbelief, but the reality was all too real. I would spend the next four or so years on recovery. Not just physical recovery, but also recovery from drug addiction and a way of life that almost took me out at 37 years old (I turned 38 in the hospital). As I mentioned above, that day was a turning point, but I did not all of a sudden straighten out and stop. I said to myself I would. I meant it. Even though the investigation did not find any drugs in my body and I faced no criminal repercussions for that wreck, I still knew exactly what happened and why. And I was never going to do that again. Who would? This was not a close call, it was a direct hit. I’m not stupid. But I can do stupid things and once I started again I could not stop. I had to be stopped. That happened, too, but it’s also a story for another time. Throughout all of this, there have been people in my corner, some who knew of my indiscretions and loved me anyway, others who were just determined to save my life, and one trauma surgeon who was too ornery and stubborn to give in to my condition or the suits from my insurance company. He has since passed, but the lives he saved, not only mine, live on. My family, my kids and my parents, particularly, were hit the hardest and yet they were the most steadfast. They never left my side. The friends and mentors I have become associated with in the years since have helped to make me who I am today, and I owe them all a debt of gratitude. Seventeen years is a long time, but it doesn’t feel that way. So, why not write this tomorrow on October 17th, 2017? Well, because I’m busy tomorrow. I am now 13 years clean from all mind and mood altering substances, I have gone back to school and completed not only my undergraduate degree, but also two graduate degrees; now I am working in a job that I could never have dreamed of all those years ago. That wreck changed my life, ultimately for the better, but first my old life had to die. Maybe that’s kind of how it all went down. Regardless, every day of these past almost 17 years, as hard as some of those days, weeks and months were, have all been marked with the profound realization that I might not have made it. I am not some believer in a magical being that created the universe, us and everything, but I do believe in magic when defined in a way that leaves out the super-natural. In that respect, I have been given a gift and I try, really hard, to make the most of it.